The site of the new community center is located on a plot facing onto the public plaza. The plaza is one of the largest pieces of flat, open land available for common use in the steep mountain valley. It is often used to spread rice to dry or to host large village banquets. Anchoring the plaza at one end is the drum tower, the tallest structure in the village, whose role is largely ceremonial. In prior times, drum towers were the primary seat of governance serving as the ‘council shed’ or site of collective decision-making for Dong communities, today Dali’s drum tower may still be occasionally function in that way — though local village governance is tied directly into the much larger bureaucracy of the regional communist party system. At the other end of the plaza is the Sax altar (pronounced sā), a rock cairn filled with tall wild grasses. The altar is the metaphysical home of the grandmother goddess who holds in her spirit the past, present, and future fate of the village. A faux-heritage concrete building intended for use as a public restroom — but never operational— stood on the site of the new community center. This structure had to be demolished before building could commence. The land is publicly held by the village. There are few instances of public space in Dali, the parking lot and village gate, the opera stage, the communally occupied wind and rain bridges, a few small plazas, and the school comprise the primary public offerings. Alongside these public spaces are a very small number of guest houses that have places to eat (not quite restaurants per se), some stalls for hot breakfast snacks, and some small shops for everyday commodities like cigarettes, snacks, and soap. Though it is quickly changing as tourism in Dali grows—particularly in the past two years—there are still currently very few commercial spaces in the village. As such, the Dong building typology that makes up the majority of Dali’s urban fabric is that of closely knit private homes. In contrast to this the creation of a community center and a home for the future textile cooperative creates an entirely new type of public offering in this context. The creation of a new type of public space necessitates the adaptation of Dong typology and traditional building practice to accommodate contemporary programmatic needs. This means adjusting the space and what it signifies in ways that this traditional building typology hasn’t necessarily responded to in the past. Opening onto the plaza the space needed to telegraph its openness and intention of being welcoming for public use. This required a different kind of stance, threshold, and level of transparency for its public face. In addition to this — placing the workshop on the second floor and having the need for a kind of functional and more modern space required adjustments to traditional ways of framing and enclosing space. The key for the workshop was to make it as bright and airy inside as possible as many Dong homes are dark — which helps them stay cool in the hot summer months — but is not an ideal condition for doing fine textile work. The last space that had to adapt to new programmatic needs was the ground level, intended for storage, it also was expanded in its function to create a kind of public-garden space underneath the wooden structure that would extend the life of the plaza down through the actual building. This key move of weaving the garden (including a small running stream of water) through the building on various levels helped to further signal the open and inclusive nature of the overall architecture. A new perspective was needed to reframe or adjust traditional Dong architecture in order to meet these contemporary programmatic needs. 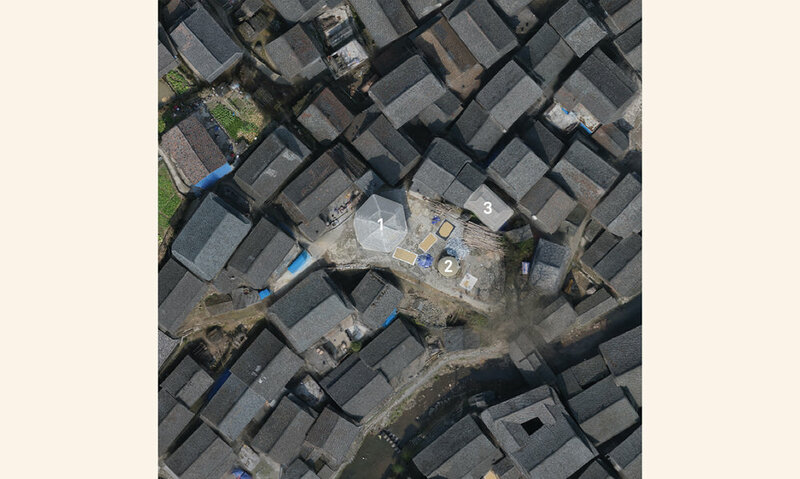 As designers coming from the outside of Dong tradition it was possible to look widely at Dong typology to see if there were elements of building across building types that could be utilized to create more formal means for expression and function in the community center. One key constraint on the center was its central and significant location in the village next to the Drum tower and Sax altar. 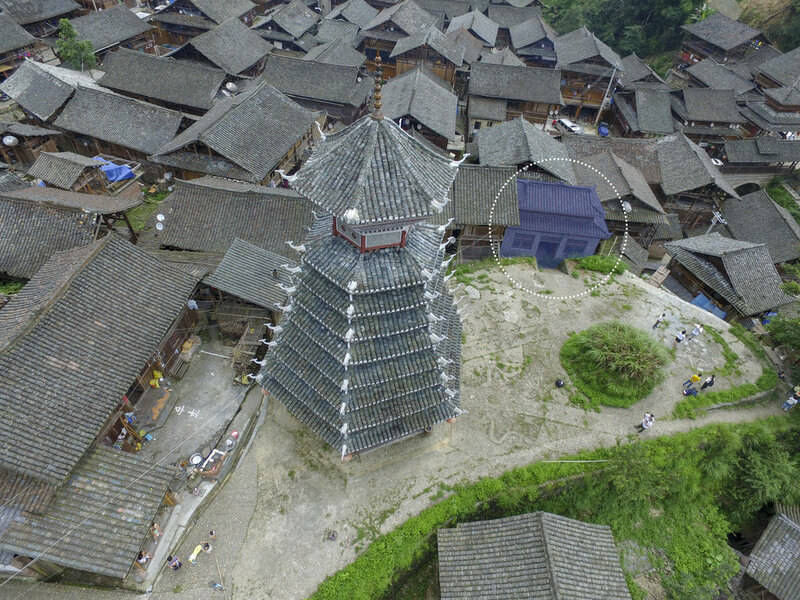 Seen from on-high by standing at the lookout point for the entire village it is clear that the center’s roofline and massing could easily block a direct view of the drum tower. This was not going to be acceptable to the village leaders and as such the scale and expression of the building had to be thought in such as way as to ensure the drum tower would remain the most prominent architecture from that vantage point. This meant thinking of ways to bring greater lightness and transparency to the overall massing as a means of directing the gaze through to the drum tower. One typology prominent in Dali as well as in other Dong villages is the granary. Along with homes the granary is a common typology repeated throughout the built fabric. These granaries are enclosed structures raised on stilts, typically without windows—for storing grain safely inside—that are combined with a wrap-around external circulation whose exterior facade is a floor to ceiling row of slats that allows grain and other produce to be hung from and dried. 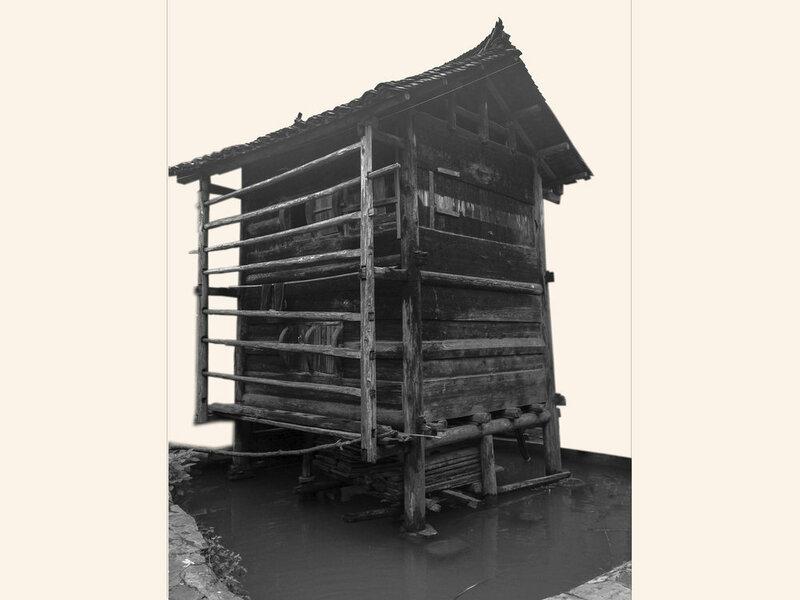 The building’s stilts very often land in a flooded plain below that can be a place to grow fish and keeps small mammals from being able to climb up into the granary and spoil the food. To extend the functionality and address some of the building constraints of the community center, ATLAS and GHF looked to the granary as a means of transforming the built vocabulary within the traditional building system. The exterior circulation combined with a slatted facade was a means of creating the lightness that the community center needed. Using this element was a way to reduce the visual weight of the overall massing while still maintaining the size of each floor plate. The concept of this lighter, more transparent physical envelope was extended to wrap around both the second and third floor of the building. The slatted facade is also here being reimagined as something that will be covered in bundles of rice drying to one that could be draped in textiles as the women work to display and create the textiles within this cooperative space. While the building may look to an outside eye to be quite traditional — using the language of the granary for a building intended for public use was a counterintuitive concept for many in Dali. 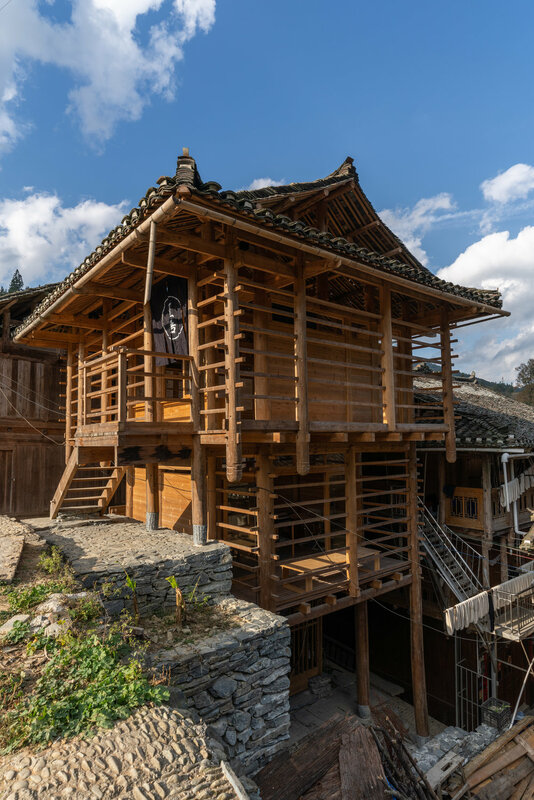 It pushed on the limits of tradition and framed a new way of looking at Dong architecture.